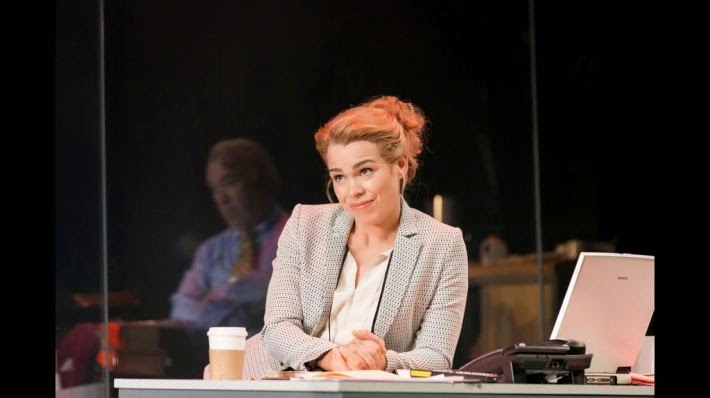 One suspects that the biggest item on the production budget of the National Theatre’s Great Britain, opening last night on the South Bank, will have been the fees of the libel lawyers hired to meticulously scrutinise Richard Bean’s work. Barely was the ink dry on the Old Bailey phone hacking verdicts last week, when the National unveiled the production, the development of which has been kept under the tightest of wraps, lest it influence said trials. The play examines the incestuous relationship between government, press and police and although Bean may well be the nations's latest favourite funny man, as he rides the success of his One Man, Two Guvnors, fans of that blockbuster (also Hytner directed) be warned, there is no eye-watering comeddia dell’arte slapstick to be found here. Rather, Great Britain reminds one of TV's long lost Spitting Image, with gloriously recognisable lampoons of some deeply uncomfortable truths. Bean's text offers nothing that is revelatory. Billie Piper puts in a cracking turn as Paige Britain, News Editor of The Free Press, the country's biggest selling red-top tabloid paper. Where many of the play's characters are blindingly obvious caricatures of the famous, hers is perhaps the best dramatic creation of the night, a manipulative Chorus at times speaking directly to the audience, elsewhere to be found fellating her way up the greasy poles of male-dominated legislature and law enforcement. Some of Bean's gags are en pointe, others crash to earth in moments of blinding obviousness, yet amongst this witty yet ultimately depressing slice of modern life, there are some standout performances alongside Piper. Robert Glenister is a monstrously monstering Editor, ultimately promoted to spin doctor at No 10, Andrew Woodall is a chillingly beliveable Head of PR for the Metropolitan Police whilst Aaron Neil’s cop, Commissioner Kassam is a cracking performance though only of a thinly sketched out bumbling stereotype. The media-mogul who owns The Free Press is Paschal O’Leary a self-made Irish billionaire and whilst Dermot Crowley delivers am entertaining performance, neither he nor the play are a patch on Anthony Hopkins’ grotesque Lambert Le Roux that bestrode the Olivier stage in David Hare’s Pravda, some 30 years ago. Bean's writing takes aim at nearly all of the fourth estate. Paige Britain makes no bones in admitting her rag is an “end of the pier” show for the nation, whilst other recognisable broadsheets include a sniggeringly titled The Dependent and best of all, The Guardener (sic) whose strapline is "We think, so you don’t have to". We laugh at the buffoonery and manipulative chicanery, whilst Neil’s performance as the first man ever to be tazered on stage is a cracker. The dark side of this abused democracy is here too. We learn of an innocent man lynched because of a misleading story in The Free Press, we see a story about Jimmy Savile spiked by the newsroom, and a good cop kills himself as the corruption of his moral fibre sees blind justice led astray. That the (fictional) abducted young twins however, whose phones are hacked by Britain’s team, are called “Mills” is crass. Don’t the Dowlers deserve any respect? This name should be changed forthwith. Great Britain deserves plaudits for its immediacy, relevance and outstanding stagecraft, that sees the nation’s leading theatre assemble a fine company amidst stunning sets and technical wizardry and challenge head on three of the country’s most powerful institutions. It might not be the National’s best, but it’s a damn good play nonetheless. Catch it if you can.